Australian Winter Olympian, Jono Brauer, launches The Arc skier program in Italy and Canada this northern hemisphere winter for Aussie Interschoolers wanting to improve their skills while on holiday with their family. Image provided by The Arc. Harrington/Ellis. Are your kids aged between seven and 18? Do they love competing in Interschools and ski in their sleep? 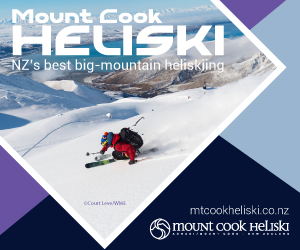 Have we got the ultimate northern hemisphere ski program for them and snow holiday for you. Aussie Winter Olympic alpine racer, Jono Brauer, has teamed up with race coach Gianluca “Pippo” Valeri to create The Arc Skier Program. An intensive two week ski training camp that focuses on Interschools disciplines from alpine racing to skier x, moguls, slopestyle and also caters for the whole family with a holiday experience. There are two winter destinations to choose from: Livigno in Italy for a multi discipline, core skill development program and Whistler, a more alpine specific program in British Columbia, Canada. Both world-class ski resorts with a huge variety of terrain for the two week development program. The best part is the program is actually for all the family, non skiers, causal skiers and non competitive skiers alike. You just bring your ‘interschooler’ and while they’re training you can leisure ski, eat pasta in Italy or drink Bloody Caesars in Canada. Indulge in The Arc’s pre-arranged luxury experiences for the grown-ups (a day trip to St Moritz and one to QC Terme Bagni Vecchi in Bormio), plus an early morning ski with a gourmet on-mountain brekkie morning for all the family. There’s also welcome and end-of-program drinks for all the family – giving you the chance to meet other like-minded ski loving families. With some of the world’s best coaches at their disposal, The Arc knows the key to developing young skiers is working on solid all-mountain skills that then transfer into gates, moguls, skier x or slopestyle courses. As a result, programs focus on multidisciplined core skill development, in alignment with Ski and Snowboard Australia’s (SSA) current pathways framework for young skiers. Each group has no more than six athletes per coach, so progression is guaranteed. The result? A stronger, well-rounded skier who can adapt to the ever-changing, variable conditions thrown at them. There are a number of course dates to choose from, and regardless of the location, they all offer 12 days of on-snow coaching with six hours of training per day, along with small group sizes, comprehensive video analysis, progression plans and athlete reports. 110km of terrain, dry powder and bulk amounts of incredible Italian food and wine… does life get better? Livigno is your ultimate destination for those who want to combine the best of Italy with the best of what a ski resort has to offer, including a range of accommodation within walking distance to the slopes. When the ski day is done and the lifts have stopped turning, it’s time to participate in one of the other activities on offer in Livigno – think fat biking, ice climbing, snowmobiling, ice driving courses, dog sledding, horse riding, ice quad biking, paragliding and ice skating to name just a few. Plus the town has a duty-free exemption with plenty of shops to peruse, so those looking for some retail therapy won’t be disappointed. Whistler barely needs an introduction. 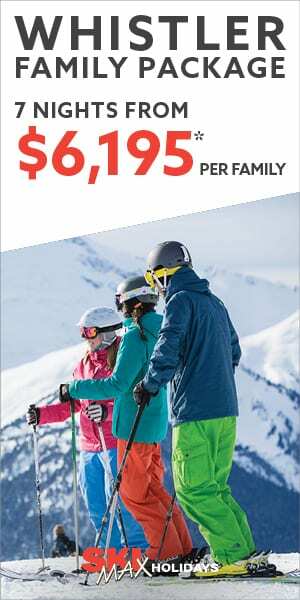 As North America’s largest ski resort, it’s a household name among skier families, and with good reason – the terrain is big and the snow is even bigger. Some numbers for you – 38 lifts, a skiable area of 4,757 acres (1,925 hectares), more than 200 marked trails and an average yearly snowfall of 10.22 metres plus 1530 metres of vertical. Impressive. 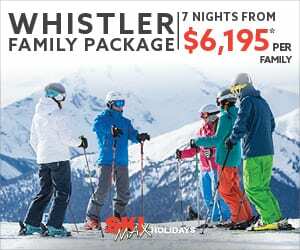 And with a huge variety of restaurants, bars, pubs and activities, including the Olympic Park, you can go shopping, eat your way through both villages at the bases of Whistler and Blackcomb, or even try a bobsled ride. The program itself is a rare opportunity for budding ski champs to train alongside Whistler Mountain Ski Club, under the expert coaching hand of Jono together with Whistler-local and one of Canada’s greatest alpine ski racers Britt Janyk. Programs start from $3300AUD per athlete for a two-week program, with programs running in January and February of 2019. For more information, or to register your child and book your family holiday, click here for The Arc website. For the most streamlined booking process, contact The Arc’s partner Travelplan Ski Holidays who can arrange all aspects of your holiday including accommodation, flights and transfers. Follow The Arc on Facebook to keep up to date with all their news.